Modernist neo-gothic building, at the corner of Pla del Palau and Plaça de les Olles. Go downstairs to meet the crowds / the people / leisure and the cultural life of Barcelona. Pablo Picasso arrived here with his parents in 1895 and had his first atelier in front of our building. The Picasso Museum is at three minutes from home. The new World Cultures Museum is nearby. The Mercat del Born is also open to visitors, showing archeological remains of Barcelona in the XVIIIth century. The flat is all windows and little balconies. Furnished like a yacht, in front of the Port Vell. 4th floor, no lift, rewarded with charming views of a lively little square. 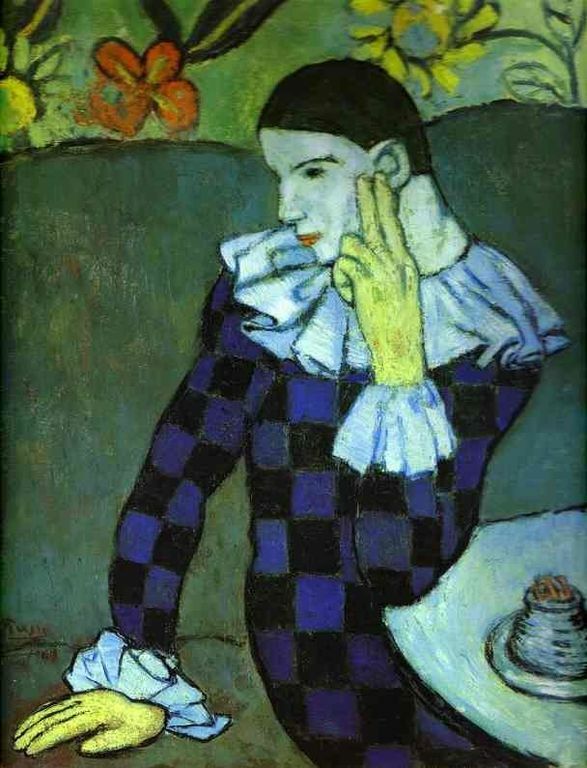 Painted in green Picasso colour. High Philippe Starck table on wheels for your dining / writing / drawing / and gazing at the square below. Spacious sofa under the Library with books about Picasso / Catalan Art / The History of Barcelona / General Art and Literature. Master bedroom with king-size bed, fine bed-sheets and optical wi-fi. Corner for personal computer and night writing. Second bedroom with moveable sandwich beds, sliding table for writing and drawing. Open kitchen with all the appliances for quality cooking and a teppan grill. Bath-room in black marquina marble, hydro-massage, shower room. All windows with double panes. Reach Santa Maria del Mar (2 minutes), the oldest church of the city (read its story in "Catedral del Mar", by Ildefonso Falcones) and listen to the bells. Walk on the Paseo del Borne (2 minutes), the promenade of XVIIth century Barcelona. Discover the boutiques and quality shops. Enjoy the Picasso Museum with special exhibitions and events (3 minutes). Stroll in the Parc of the Ciudadela (5 minutes) and enjoy spontaneous ethnic music. Cross Pla del Palau and enjoy watching the boats of the Port Vell, the Maremagnum, the Aquarium. Walk along Paseo Colón, the old sea-shore, and reach the Ramblas (7 minutes). Stroll / skate / bike along the beaches, from the Barceloneta (8 minutes) to the Port Olimpic and beyond. Downstairs, we are very well connected with the Eixample and Barcelona's many other significant sights. The Sagrada Familia is close by. The Paseo de Gracia and other famous modernist buildings are also near. VERDE PICASSO sleeps 2 grandly. 2 + 2 very comfortably. The use of green graffiti on the façade designed by Arch. Enric Sagnier is considered unusual and charged with spiritual value. Green captures solar energy and turns it into vital energy. Green is the symbol of spiritual regeneration. It signals the end of winter and symbolizes hope. It's the colour of nature. In Egypt, Green was an attribute of Phtah - the creator and the stabilizer through water - because in Egyptian cosmogony water was the primary agent of creation. It meant the foundation of time, the creation of the world; and it symbolized material and spiritual birth. In Christianity Green meant regeneration through acts, through charity. In China Green defines the East, dawn, spring, wood and, again, charity. as also culture, wisdom, and renewal. We painted our flat in Green - an important colour in Picasso's palette. Profits from our rentals are invested in cultural and social projects in Communication for Peace. We chose this property because we love the Barrio del Born - la Ribeira for its location, its history, its craftspeople. Downstairs you'll be right at the heart of XVIII - century Barcelona, with its own pulse and style. It is pedestrian and lively at all hours. Walk around the Passeig del Born, el Mercat del Born, la Catedral del Mar. Visit the Parc de la Ciudadela and enjoy the music at sunset. Walk to the Port Vell and watch the sailing boats arriving at sunset. Shop at the Maremagnum, reach the Barceloneta and the Ramblas. El Barrio del Born has a unique liveliness and style. The marquina marble bathroom features a double tub with whirl and hydro-massage + a separate shower-room. The lighting is adjustable. Quality cotton towels and bathrobes are available. Very good quality SMEG refrigerator + freezer. High-quality kitchen with all necessary utensils, including: traditional oven with dual cooking options, which includes steaming; teppan, Japanese-style grill, perfect for sea-food and vegetables. The flat is L-shaped. Every room has its window and balcony with a view. Great location and flat! For El Born, it was pretty quiet at night. It may be louder in the summer, but it was perfect for us with a small child. We loved the big bed and big tub. The kitchen, bathroom, and the washer/dryer had the basics. The heat took a while to kick in, but it was perfect once it reached temperature. Johnny met us to give us the keys and orient us to the place and appliances. He was very nice and thourough. There are a lot of stairs so be prepared to walk up them a lot, but it's well worth the location and comfort of the apartment! Thank you very much for the review, Rachel. You are welcome again, anytime, as a friend of the house. Great location in a cool neighborhood filled with restaurants, bars and shops. Overall the stay was great. But it took forever to get the keys to the apartment (after 7pm) and the smell in the stairwell was off putting. Plus the light was out on the forth floor where the apartment is. The actual apartment was nice and did not smell funky like the stairwell. VRBO also said the place was available for my requested dates then after confirming and accepting my payment, I was told that the first night it wasn’t really available. We had to find a second place to stay. Frustrating. Once we finally got in, we did like the place. It could use some more lights and the beautiful glass door to the bathroom was cracked. But it had lots of character and had a washer and dryer. Overall it was a positive experience. Hello, Dina. Thank you for your review. Your feedback has been taken into consideration and the necessary improvements have already been made. You are a wonderful person and were a wonderful guest. We hope to host you again in one of our properties. as a friend of the house. We did have trouble getting in to the property. HomeAway was very helpful in communicating with the owner. She generously offered to pay for the dinner we had across from the apt while we were waiting to have the issue resolved. We have not seen the reimbursement as yet but am certain it is forthcoming. Stairs (78) are not for the faint of heart. Air conditioning and washing machine/dryer were appreciated as was the WI-FI. Never did figure out how to work the oven or TV. Great book collection helped us get better acquainted with Barcelona. In the heart of El Born, funky flat. The old quarter has so much charm and so did the flat. Fourth floor walk-up looking over small neighbourhood square, Placa de Los Olles. Stocked with art books and Barcelona literature. All amenities within flat... bed comfortable and large bathtub. Verde Picasso is a very comfortable and elegant flat in an excellent location. We provide 24/7 service for our guests and do our max to respond to queries. We ask our guests to write immediately, without hesitation, if something is not working properly we act immediately to provide the solution. We have had many international guests in the past and many return for the second and third time. Future guests, please write immediately if you need anything specific / extra. We will take care of your needs. What a fabulous stay it was! Atmospheric room with good selection of book and CD, excellent location, etc. I will come back again in the near future. Only one notice, there is no elevator in the apartment, so I don't recommend persons who have some difficulty walking up steps to stay here. Anyway, I enjoyed the stay to the full. Thanks. You are welcome again at Verde Picasso, anytime, as a friend. Ciutat Vella de Barcelona - Barrio del Born! Charming Plaça de les Olles - next to Pla del Palau, el Passeig del Born, the Picasso Museum, el Port Vell, las Ramblas, Plaça Catalunya. Famous restaurants, tapas bars and night-clubs: depending on you ! They are downstairs. El Palau de la Música, famous art galleries, fine shops and craftsmen in our Barrio del Born. Profits from our rental are invested in Cultural and Social Projects - Comm4Peace.